Like most UK SSTs it's a 2008 box so is the 8631A749 TCU hardware version with the 8631A3790C by default so I did the usual upgrade to the 2009 SST firmware (8631A8270B) to enable the teach in and then ran through the process. I noticed however the July 2016 Mitsubishi TSB states that the 2008 boxes should then be flashed back to 8631A3790E (8631B413.cff) instead of the original 8631A3790C (8631A749.cff) that I've used previously. Does anyone actually know what the differences are between the C and E versions of the firmware actually are? All I can say is that after performing the teach in and reverting to the E firmware the shifting is great, however I can't tell what is down to the different firmware or the teach-in itself or the box being up to temp for a change (I haven't tested the cold shifting performance yet as I need to leave it overnight to cool down). I went through this kind of process with my last SST, although it was never reverted back to the original but left (on a few occasions) either with the very latest firmware or the teach-in version. And the only reason it was left with the teach-in version was to avoid the time hassle of making another firmware change after the actual teach-in. Between the three versions I would honestly have to say I could not pick out a single significant difference in the way the car drove or performed. Perhaps there was just one occasion when I felt that with the latest version the gearshifts in Normal and light throttle acceleration were programmed at a few hundred rpm higher, but I never properly checked that out by comparing before and after logging. But what I can say with great confidence is that the period up until selling the car a few months ago was that on the tech-in version the gearbox operation was as close to perfect as I think is possible with an SST. Even the very first gearshift of a cold morning was super smooth (in Normal)! The only caveat to add here is that the clutch plates were of the first Dodson upgrade variety and it also had a heated sump. And a note of caution that I've sounded before - if the mapper has made any changes to the SST tables in the main ecu then the comparison of performance between SST firmware versions may well be different/accentuated! Last edited by plip1953; 07-01-2019 at 08:46.. I think I've managed to answer my own question digging through the TSB's and it seems that the difference between the C and E versions of the 8631A379 firmware is that it stops the 5th gear cold start test that sometimes causes the box to crunch on startup for some people so there probably aren't any other differences. 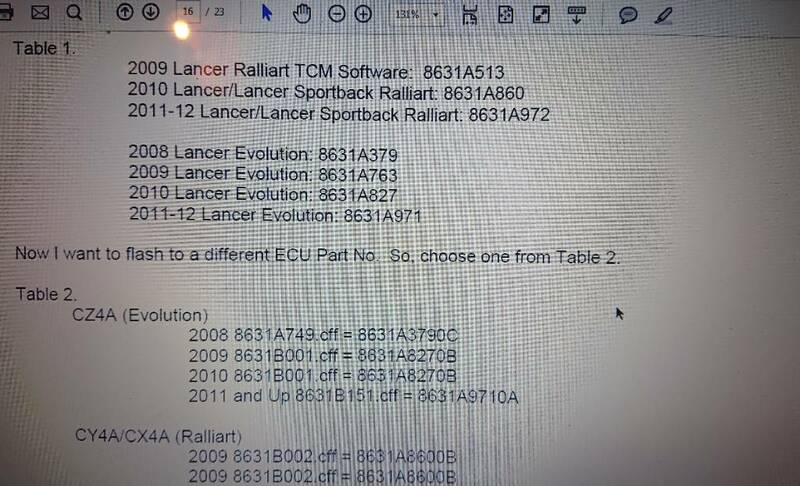 As for the debate about whether there are any differences between the 2008, 2009-2010 and 2011+ firmwares it seems fairly clear to me that there are differences in the hardware in the box and the mechatronic unit which require subtle differences in the firmware - otherwise why would Mitsu/Getrag insist that you revert to to specific versions. I must admit I tried all three firmwares on the box before I had the box rebuilt and didn't notice much difference (aside from some weird clicking noises in the 2011+ firmware), however this time I certainly noticed a difference in the shifts between 2008 and 2009/2010 firmwares. It's worth noting that I always use manual shifts in Sport mode, which I think probably adds a number of additional complications for smooth changes as I likely don't always switch at the optimal points and normal is designed to soften the shift anyway (note: my car is also running the stock 330 EcuTek map so that doesn't come into it). I do think the heated sump is probably the best update you can do for the SST (despite me not having one) as its best operation in dependent on keeping within a specific temperature window and from experience the worse the SST is working in general the more that impact can be felt. I've had it overheat in traffic since the rebuild and it can become quite grabby at low rolling speeds so it's not just cold that it doesn't like. Fortunately the car continued to change gear great this morning on the short drive to work despite the cold start so it's currently working the best it has ever worked, although the caveat being it was 8C outside rather than the -4C we've seen recently. What's a 5th gear cold start? I don't know why Mitsi/Getrag insist (or it is simply a recommendation to main dealers). I didn't hear any odd clicking noises with any version I've used. I think more SST owners in general should give Normal mode more of a chance. Mitsu/Getrag will be very cost conscious so if they are explicitly asking for people to upgrade to the 2009 firmware to do the teach-in and then back to 2008 afterwards then you can be sure that there is a reason for it rather than just to waste everyone's time (and indeed Mitsu's own money if the work is being done under warranty). It's pretty clear that there are three different hardware revisions of the SST/mechatronic unit so it makes sense that they should have different firmwares to accommodate the differences. The "5th gear cold start test" is a diagnostic test that the SST performs when the car is started from cold where it briefly engages 5th gear slightly causing the car to step forward against the handbrake/parking brake. Apart from the forward movement it results in various noises (clunks/thuds) and for some people occasionally a gearbox crunch so Mitsu/Getrag seemingly removed the test as people were bringing cars to dealerships saying the gearbox was dying. It's not so much the gearbox response in normal mode that I have an issue with it's the throttle response on the accelerator pedal in that mode that makes it so poor. Normal is more like a standard automatic set up where you have to push the pedal much further whereas I prefer sport mode as the pedal is more sensitive like a manual car. Wasn't there something about the later firmware version removing the 1st gear torque limitation that applied to all the UK SSTs? A new one on me - interesting. So was its deletion achieved by a firmware upgrade? If so, what which to which versions? Interesting that you think the changes in Normal have improved with time, although I was always pretty clear that there wasn't any kind of on-going learn function associated with the SST. The 300 SST was the only UK model to be nerfed with the 1st gear torque limit for some reason - possibly so they could make it a selling point of the 330. For the 8631A379 HW ver SST box we have in the 2008 UK models it was removed between the 8631A3790C (8631A379.cff) and 8631A3790E (8631B413.cff) firmwares. It certainly does try to self adjust for clutch wear over time, however whether it simply estimates this based on time/shifts or uses actual feedback from the slip sensors I'm not sure. What we can definitely say is that whatever the mechanism is it doesn't do as good a job as the teach-in process. Ultimately the pressure to keep the clutch plates engaged saps power from the engine so from a performance/efficiency perspective the goal is provide just enough pressure to keep the clutch engaged and no more. This is why when the seals start leaking the SST starts playing up (slip, rev flare etc) as the various coefficients (clutch wear, temperature, torque etc) it uses to calculate the required pressure give a result for the expected conditions and can't accommodate the pressure leaking out. So let me help you out a bit as I've been doing some work with the sst gearbox in the past weeks. A bit of a background info first of all. Car is stage 1, custom tune for engine as well as some tuning on the sst pressures. All done to our local tuner who has deep knowledge on evos. Car has roughly around 60K km and at around 30K it did its first sst oil change. A few weeks ago I did another oil change with castrol transmax dual. I also asked to perform teach in. 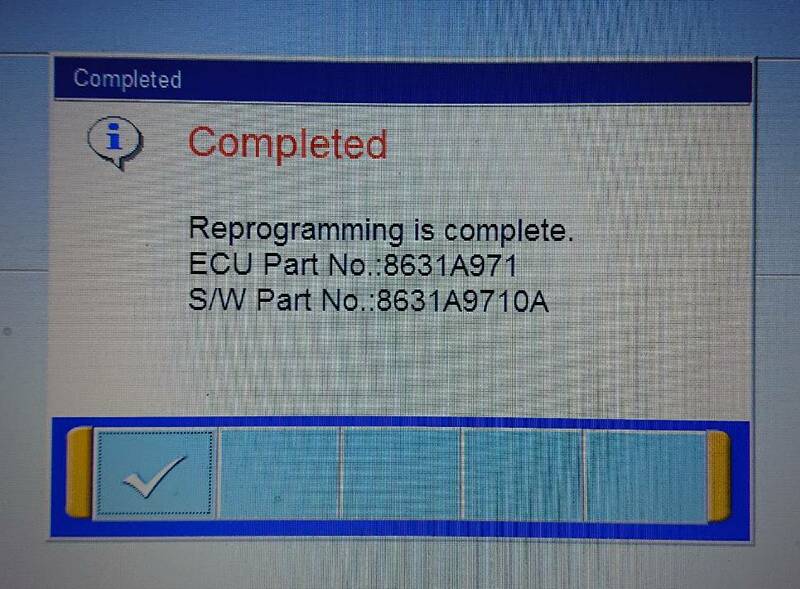 Sadly with the firmware I had it was not possible so the service center had to reprogram the tcu to the 2009 version 8631A8270B. Immediately I noticed a few differences. On a different thread I posted a recent update on my car which I fitted the racecapture track unit. So I'm able to monitor rax patch data. On racecapture I noticed a small increase in clutch pressure from 10 to 11 bar. After we installed the custom sst map at super sport with custom map selected on clutch pressures I saw 12 bar, but still far from the 14 bar which should work. 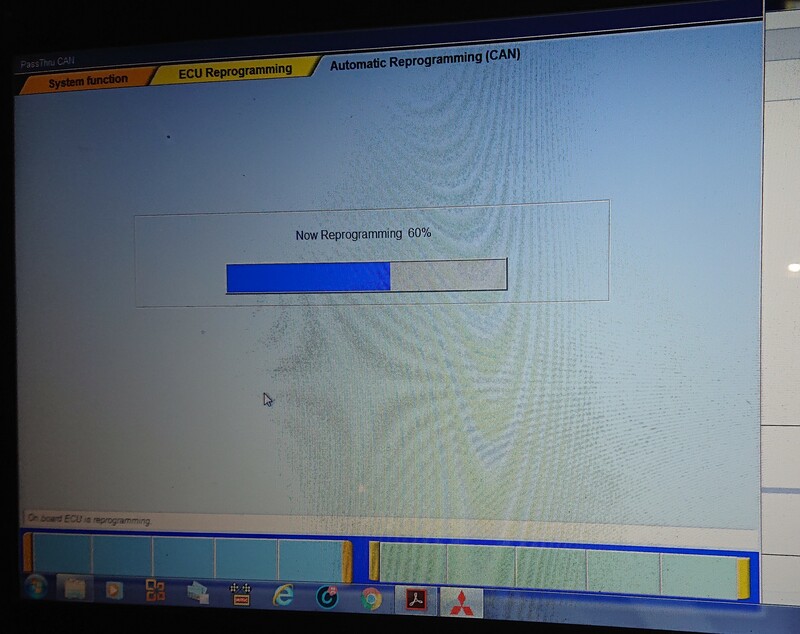 So what we did (BTW my car is a 2010 evo x sst, 2009 built) was that we flashed the tcu to the latest firmware. Please have a look at the firmware list. Why it was critical to update? Because the guys here have seen increased pressure with this firmware so it was important to see if this would solve the low pressure situation. Low clutch pressure creates clutch slip. After that we did the extensive teach in (long procedure, the one that you go through all the stages, switch off wait 10 seconds then go through 4 more steps again. Don't remember exaxclty the sequence but I can check it). And then went out to try it. Put the car in super sport and immediately I noticed a huge improvement in clutch bite and it was even more noticeable when shifted to 2nd even at low rpm as you felt no slippage and a slight kick. And then found a nice straight and floored it. So our faces smiled when we saw 14,3 bar pressure and felt the kick instantly! I suggest you try it as well and advise any updates. In Greece we have two very powerful SSTs (one 750 the other 850hp) so our tuner is very experienced. Oh and something I forgot. It is critical for securing solid sst performance to change oil every 30k km and perform teach in every 6 months. Last edited by Nikos! ; 07-01-2019 at 20:00..
Find More Posts by Nikos! 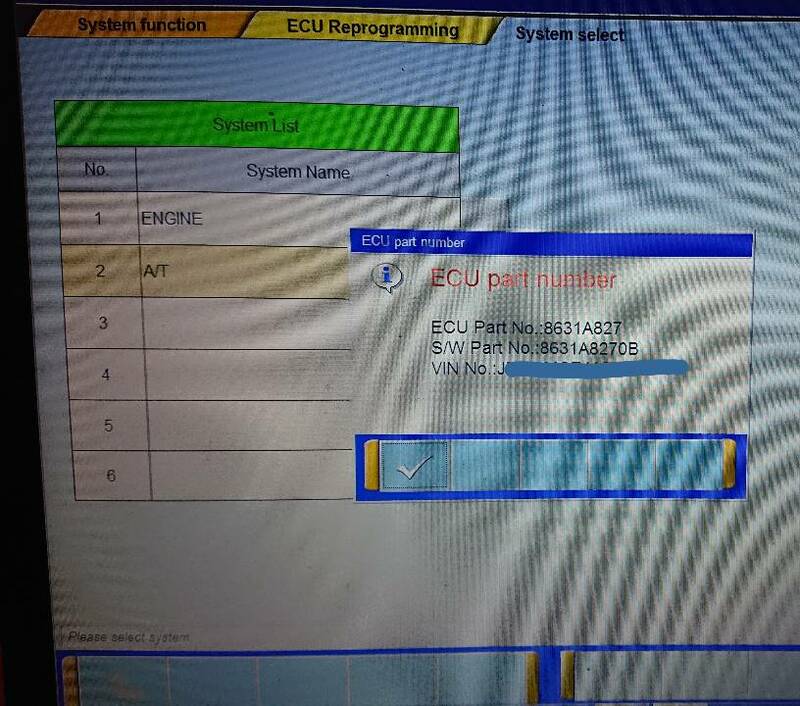 Provided that the ECU SST torque tables are correct then you shouldn't see slip with the correct version of the SST firmware as it should calculate the required pressure based on the torque demand from the ECU. Certainly if your box is slipping with stage 1 power you've probably got other issues with the SST unit itself or the map in the ECU. If you weren't able to do the teach-in chances are you have a 2008 SST unit as I believe all the 2009 firmwares allow teach-in by default. Mitsu patched the cold start out of all firmwares in 2014 (or earlier) as per my earlier post so provided you have the latest version of each of them then you won't get the mechanical start up noise on any of them (see the TSB here). 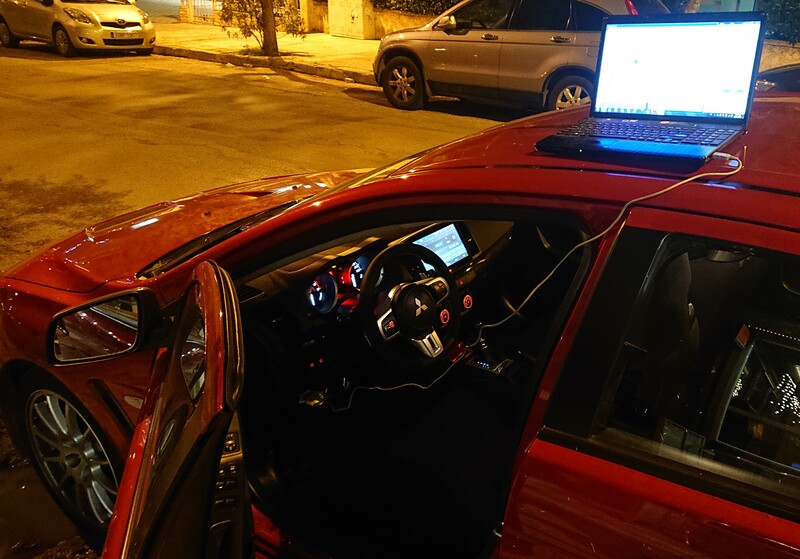 You were only getting them as your car was still on the original firmware for the 2008 SST unit rather than the updated 2008 version they have available now. The increased pressure you are seeing is an example of what I mentioned earlier in the thread (i.e. the 2011+ SST has a different physical design than the 2008 unit) and it's not necessarily a good thing. For example if the pressure is consistently higher then it may cause clutch dragging, side effects with the mechatronic operation or simply rob the engine of power for no benefit.